Jewish Agency says they're 'ready to receive' Ethiopian immigrants but haven't received names of candidates from government. Thousands of Ethiopians with family members in Israel have again had attempts to join them delayed, this time by a paperwork logjam, Israeli officials said on Sunday. Threatened by a revolt on the issue within the ruling Likud party, Israeli Prime Minister Binyamin Netanyahu's government pledged in April that 1,300 Ethiopians would be admitted within 12 months out of a possible 9,000 set to arrive over five years. Since then, only 64 have entered the country, prompting MK Elie Elalouf (Kulanu) to say last week that Israel had "abandoned the Jewish community of Ethiopia despite the promises." A spokesman for the Jewish Agency, a quasi-governmental institution that encourages diaspora communities to move to Israel, told AFP on Sunday that his organization was waiting to receive the names of those eligible from the government. "The Jewish Agency is ready to receive them and we will carry out the government instructions, but we have not received lists of candidates from the interior ministry," spokesman Yigal Palmor said. 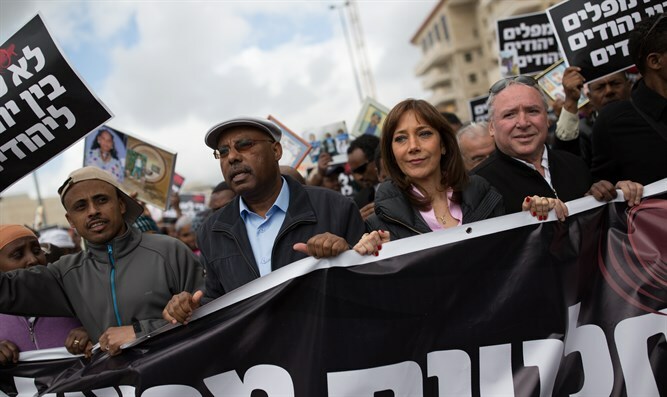 Ethiopian-born MK Avraham Neguise (Likud), who chairs the Knesset's immigration committee, accused the ministry of "deliberately putting spokes in the wheels" of the attempts to reunite Israeli Ethiopians with their kin still in the African nation. The country's Ethiopian community numbers around 135,000 people, of whom more than 50,000 were born in Israel. The bulk of Ethiopia's Jewish community was brought to the country between 1984 and 1991 under the Law of Return guaranteeing Israeli citizenship to all Jews. Those still trying to join them are members of a community known as Falash Mura, descendants of Ethiopian Jews who converted to Christianity, many under duress, in the 18th and 19th centuries. They are not recognized as Jews by Israeli authorities but claim the right to immigrate under family reunification rules. Government approval for about 9,000 claimants was given in November 2015 but then rescinded in March the following year, citing budgetary constraints. In April 2016, the government promised to bring 1,300 immigrants out of the previously promised 9,000.